Just because you're old...ER and your kids are grown...UP doesn't mean you cannot enjoy their company. Buying our tickets several weeks ago, both the Pres and I were looking forward to going to the The Big E with Jennifer, Angel and a few of their friends. Planning on arriving mid morning at the sixteen day fair held in West Springfield, Mass, my daughter and I had already talked about how great the hot mini cinnamon~sugar sprinkled donuts would hit the spot with a nice cup of coffee. I salivate every time I think about them and since there will be a chill in the air, that's the plan! Meanwhile, the Pres has been talking about some kind of sausage and pepper delight on a Portuguese roll with a side order of deep fried veggies. Yes, it's time for some fun and an over indulgence of carbs! Oh, one more thing. 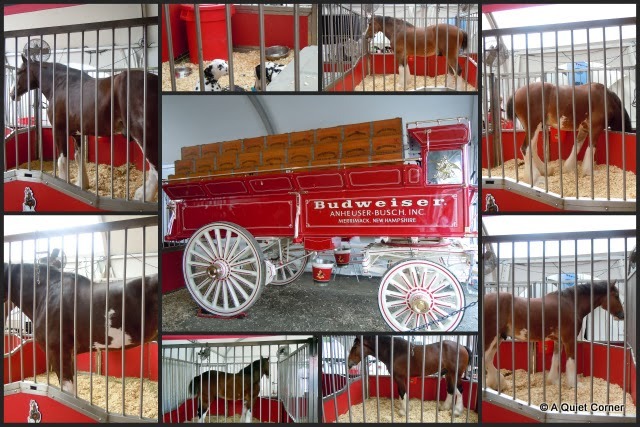 The barn housing the Budweiser team is always on my list and usually that's before I get that giant baked potato from Maine! That is the best part about fairs, the food.